Shifting dietary patterns, a decline in energy expenditure associated with a sedentary lifestyle, an ageing population - together with tobacco use and alcohol consumption - are major risk factors for noncommunicable diseases and pose an increasing challenge to public health. 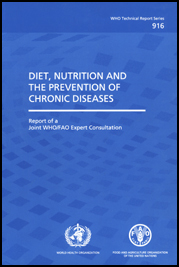 This report of a Joint WHO/FAO Expert Consultation reviews the evidence on the effects of diet and nutrition on chronic diseases and makes recommendations for public health policies and strategies that encompass societal, behavioural and ecological dimensions. Although the primary aim of the Consultation was to set targets related to diet and nutrition, the importance of physical activity was also emphasized. The Consultation considered diet in the context of the macroeconomic implications of public health recommendations on agriculture and the global supply and demand for fresh and processed foodstuffs. In setting out ways to decrease the burden of chronic diseases such as obesity, type 2 diabetes, cardiovascular diseases (including hypertension and stroke), cancer, dental diseases and osteoporosis, this report proposes that nutrition should be placed at the forefront of public health policies and programmes. This report will be of interest to policy-makers and public health professionals alike, in a wide range of disciplines including nutrition, general medicine and gerontology. It shows how, at the population level, diet and exercise throughout the life course can reduce the threat of a global epidemic of chronic diseases. The World Health Organization was established in 1948 as a specialized agency of the United Nations serving as the directing and coordinating authority for international health matters and public health. One of WHO's constitutional functions is to provide objective and reliable information and advice in the field of human health, a responsibility that it fulfils in part through its extensive programme of publications. The Organization seeks through its publications to support national health strategies and address the most pressing public health concerns of populations around the world. To respond to the needs of Member States at all levels of development, WHO publishes practical manuals, handbooks and training material for specific categories of health workers; internationally applicable guidelines and standards; reviews and analyses of health policies, programmes and research; and state-of-the-art consensus reports that offer technical advice and recommendations for decision-makers. These books are closely tied to the Organization's priority activities, encompassing disease prevention and control, the development of equitable health systems based on primary health care, and health promotion for individuals and communities. Progress towards better health for all also demands the global dissemination and exchange of information that draws on the knowledge and experience of all WHO'S Member countries and the collaboration of world leaders in public health and the biomedical sciences. To ensure the widest possible availability of authoritative information and guidance on health matters, WHO secures the broad international distribution of its publications and encourages their translation and adaptation. By helping to promote and protect health and prevent and control disease throughout the world, WHO's books contribute to achieving the Organization's principal objective - the attainment by all people of the highest possible level of health. The WHO Technical Report Series makes available the findings of various international groups of experts that provide WHO with the latest scientific and technical advice on a broad range of medical and public health subjects. Members of such expert groups serve without remuneration in their personal capacities rather than as representatives of governments or other bodies; their views do not necessarily reflect the decisions or the stated policy of WHO. An annual subscription to this series, comprising about six such reports, costs Sw. fr. 132.-or US$ 106.- (Sw. fr. 92.40 in developing countries). For further information, please contact Marketing and Dissemination, World Health Organization, 20 avenue Appia, 1211 Geneva 27, Switzerland (tel. : +41 22 791 2476; fax: +41 22 791 4857; e-mail: bookorders@who.int). Diet, nutrition and the prevention of chronic diseases: report of a joint WHO/FAO expert consultation, Geneva, 28 January - 1 February 2002. 6. Cost of illness I. Title II. Series. All rights reserved. Publications of the World Health Organization can be obtained from Marketing and Dissemination, World Health Organization, 20 avenue Appia, 1211 Geneva 27, Switzerland (tel: +41 22 791 2476; fax: +41 22 791 4857; e-mail: bookorders@who.int). Requests for permission to reproduce or translate WHO publications - whether for sale or for noncommercial distribution - should be addressed to Publications, at the above address (fax: +41 22 791 4806; e-mail: permissions@who.int). This publication contains the collective views of an international group of experts and does not necessarily represent the decisions or the stated policy of the World Health Organization or of the Food and Agriculture Organization of the United Nations.